Is China about to abandon its long-held policy of 'no first use' of nuclear weapons? Geopolitical experts and think tanks have come around to believing that the possibility of China junking that age old commitment is quite high. If China abandons its no first use policy, formulated in 1964, it would be because it's seeing a more potent threat from the US than before. China's successful testing of new submarine-launched ballistic missile, the JL-3, last year significantly altered the US perception of Chinese maritime assault capabilities in the region. Though the Donald Trump administration knows that the US is way ahead of China in nuclear capabilities, the development of the new SSBN submarines that can be fitted with the JL-3 missiles will give the eastern rival an upper hand in the turf war playing out in the South China Sea.India test-fires its nuclear-capable Agni-II strategic ballistic missile from a military base in Odisha. This assessment has prompted the US and allies to step up their anti-submarine warfare in the South China Sea and the Indian Ocean, according to Zhao Tong of the Carnegie's Nuclear Policy Programme, the South China Morning Post reported. The growing mistrust and the struggle for oneupmanship might lead to China dropping the no first use principle, Zhao said. Washington-based US-China Economic and Security Review Commission also noted that there is a growing debate in China whether it should hold on to the no first use policy, the SCMP reported. What is China's no first use policy? China proclaimed the policy in October 1964, immediately after it exploded its first-ever nuclear test device, becoming the world's fifth nuclear weapon state after the US, Soviet Union UK and France. The solemn pledge had two parts, one aimed at nuclear powers and the other meant for non-nuclear states. Beijing said it will "not be the first to use nuclear weapons at any time or under any circumstances" and also that it will not use "use or threaten to use nuclear weapons against non-nuclear weapon states or nuclear-weapon-free zones" (NWFZs) under any circumstances." However, the geopolitical balance has changed drastically since the 60s and the weapons capability of the nation has undergone changes too. While sceptics in the West always had distrust for the Chinese pledge, military analysts had also pointed out that China didn't have preemptive, first strike capabilities to thwart the US designs. Taylor & Francis explains the future of the no first use policy succinctly: "Although it appears that China will most likely to continue to stick to its pledge of the no-first-use in the foreseeable future, the fate of the policy hinges, in a large part, on the evolution of China–US relations in the growing major power competition. China's serious rift with non-nuclear weapon states on the role of nuclear weapon may also have important bearings on its no-first-use policy." India has been wary of growing Chinese clout in the region and Beijing's weapons modernisation overdrive. Many Chinese military experts have opined in the past that China should drop its no first use policy in the Indian context. Experts have also demanded that China should be prepared to use nuclear option in case its territorial disputes with India over Arunachal Pradesh or other border flashpoints worsen. The US defence department released its 'China Military Power' report last month, which indicated that China has nearly surpassed all other nations in some key military technology. The report said that China has reached the leading edge of many key technologies, helped by its policy of 'acquiring technology by any means available. 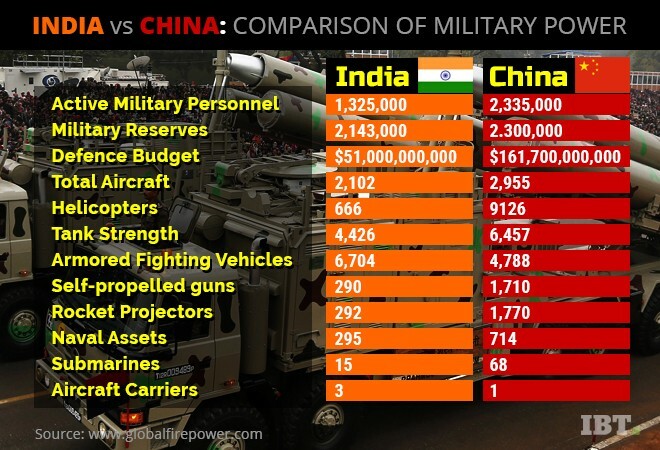 After making some of the most advanced weapons in the world China is in the cusp of imposing its will in the region, which includes India.